The Swedish forwarder market is the most important for CTL-manufacturers as it’s the largest market of all for forwarders and harvesters. Last year this market showed great strength. The sales where up with 10 percent compared with 2016 and the total number of registered forwarders counted to 331 machines. John Deere kept the position as number one in Sweden with Komatsu tight on as number two. The good market situation reflects a strong forest industry with increasing felling, rising wood prices and a high need for harvesting capacity. 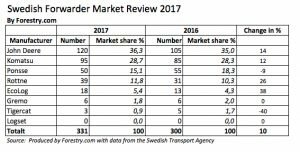 Forestry.com use official statistics from the Swedish Transport Agency to produce the annual Swedish Forwarder Market Review. All forwarders with loading capacity over 8 (metric) tons sold in Sweden are registered so it’s easy to get a good picture of the market. Her in the table below you can see the number of sold machines 2017 as well as the market shares for the different manufacturers. The number of registered forwarders varies from year to year, but the market shares of the different manufacturers are surprisingly stable. When we sum up in 2017, we see quite small differences in market share. John Deere is still on top with 36.3 percent of the market (35.0% 2016), which in number of machines means 15 more registered than 2016. Komatsu is number two and has the same market share as last year, which represents 28.7 percent of the market and ten more forwarders than 2016. Swedish manufacturers Rottne and EcoLog have also increased in both numbers and market shares compared to last year. On the other hand, it seems to be difficult for the Finns on the Swedish market. Ponsse has been working hard for many years, but goes a bit up and down in terms of market shares. Last year, Ponsse had 18.3 percent of the Swedish forwarder market, but now they’re back down to 15.1, which means five machines fewer compared with 2016. At the same time, Rottne is increasing and approaching third place. There are more Finns who struggle in Sweden. 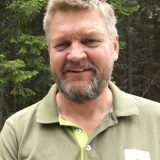 Logset, which now has several dealers in Sweden and as late as Elmia Wood 2017 flagged for increased ambitions at the Swedish forwarder market, has not registered one single forwarder in either 2016 or 2017. Finnish Sampo-Rosenlew is not included in the statistics for 2017 but according to the importer, only some technicalities around the formal inspection make the first forwarders not yet registered. They are already operating in the woods. 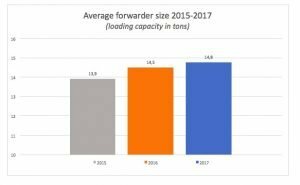 The average size (loading capacity) of new forwarders sold in Sweden has increased over last years. 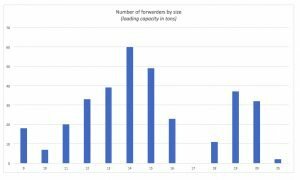 The registration statistics show that the average loading capacity of the forwarders has increased by a full ton over the last three years. Today the average forwarder loads 14.8 (metric) tons. With today’s load index, which is around 0.7-0.8 for a forwarder in this weight class, it means that a fully loaded forwarder weighs around 35 tons. With steel tracks on all wheels/boggis around we can count 40 tons. 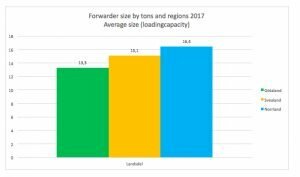 If we instead break down the 2017 forwarder market by Swedish regions, we see that forwarders sold in the south (Götaland) has an average loading capacity of 13.3 tons. The forwarders sold in the north (Norrland) loads 16.4 tons, a difference of over tree tons. In mid Sweden, the average is 15.1 tons. In the Nordic countries, all harvesting is done by the CTL-method (CTL = Cut-To-Length). 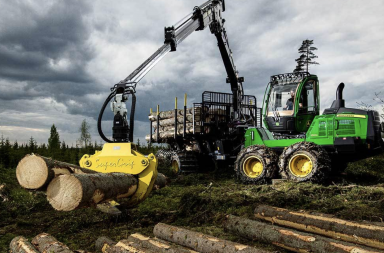 The logging is carried out by two machines working together in teams: First the harvester who fell, delimbs, bucks and cuts the trees directly in the stand, more or less at the stump. Then the forwarder who loads the logs on the bunks and drives/forward it out to the road side where a truck can reach it for transport to the industry. The machines sold in Sweden are almost exclusively from manufacturing plants in Sweden or Finland. In Sweden, there are, manufacturers as Japanese Komatsu. 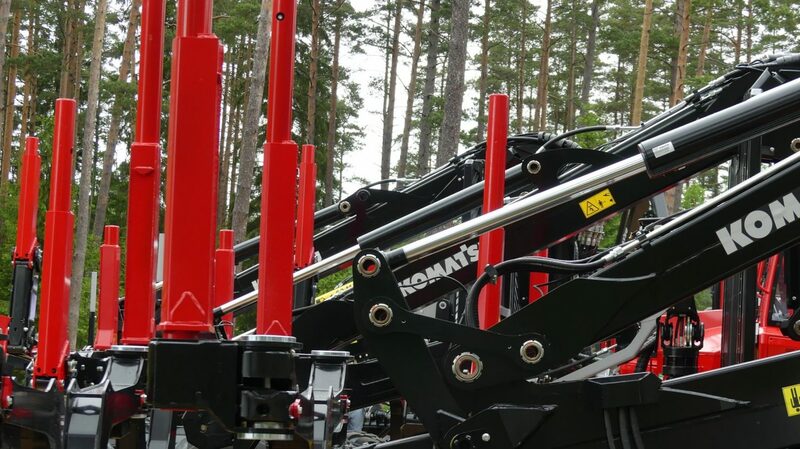 They manufactures all CTL machines in north Sweden, in the Komatsu Forest company plant in Umeå. In Sweden there are also Rottne Industri AB (in Rottne, south Sweden), EcoLog AB (Söderhamn, mid Sweden) and Gremo (Ätran in south Sweden). Those three are both Swedish owned and manufactured in Sweden. In Finland, American John Deere has all their manufacturing of CTL machines. Finnish brands Ponsse and Logset are owned and manufactured in Finland. John Deere is the market leader of the Swedish forwarder market 2017. Here is John Deere’s smallest forwarder 801E, specialized for thinning work. 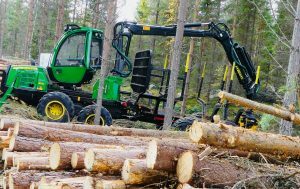 John Deere’s CTL business is a former merger of several Swedish and Finnish machine manufacturers, such as the brands of ÖSA, Bruun System, Kockums and Lokomo. The innovator Lars Bruun built the first modern forwarder in the early 60’s: The VSA forwarder who later became the Brunett. A forwarder has an engine part or “tractor part” with engine and cabin and a “trailer part” with load bunks and a crane that loads and unload the logs. 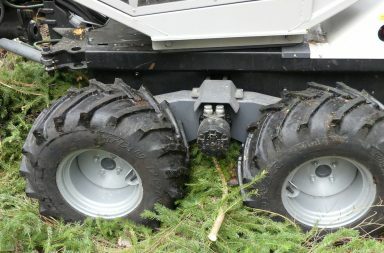 The engine and trailer parts are assembled in a waist that also steers the forwarder. 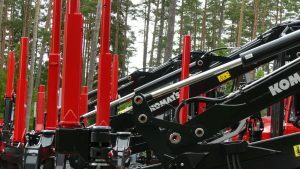 By 2019, all forestry machines sold within EU must be equipped with engines that meet EU-stage 5 emission requirements. Read more about emission requirements here. Unfortunately, there are no data to be found about the Swedish CTL-harvester market as they are not registered in official databases. However, it’s expected that the annual harvester sales are some 20-40 machines lower than the forwarders. This estimation tells us that the Swedish market buys some 600+ new CTL-machines annually which over the years have put Sweden on top among World’s CTL markets. According to several forest machine manufacture officials, this might soon change as Russia now seems to grow stronger in numbers and pass Sweden. It might happen already in 2018 or 2019.